After almost 60 years together; we shared the good and the bad, I am left brokenhearted. 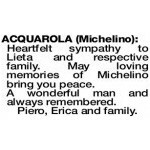 I loved you Michelino and always will, until we meet again. Rest in peace, God grant him eternal peace. 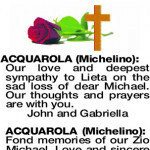 My sincere condolences to Lieta on the sad loss of my dear brother Michelino. You suffered so much, now it is time to rest. I will miss you dearly and treasure all the wonderful memories. You will be forever in my heart. Rest in peace my dear brother. 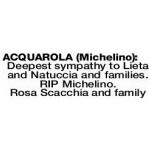 Your loving sister Natuccia. 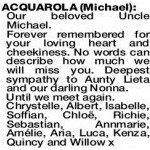 Uncle Michael you always treated us as your own and were always so protective of us. We love you and miss you so much. You will be forever in our hearts. Give a big hug to our dear Dad. RIP. 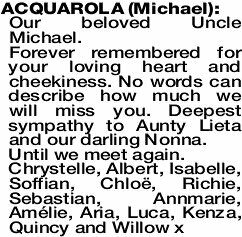 Our sincere condolences to Aunty Lieta on the sad loss of our dear uncle Michael. Even though we lived miles apart you were such a big part of our lives, we will never forget all you have done for us and we will miss you. Claudio, Flora and families. 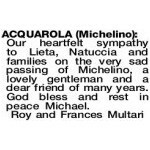 The Funeral Mass for Mr Michelino (Michael) Acquarola will be celebrated in St Brigid's Catholic Church, Cnr Aberdeen and Fitzgerald Streets, Northbridge commencing at 10:00AM on TUESDAY (23.04.2019). 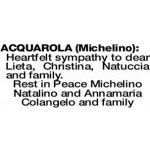 The cortege will leave the church at the conclusion of Mass and arrive at the main entrance of KARRAKATTA Cemetery, Railway Road, Karrakatta at 11:45am for a Burial service. Uncle Michael has always been part of our lives, he was always there. One of life's characters but underneath a man of strong will and quiet integrity. I still can't believe he's gone. 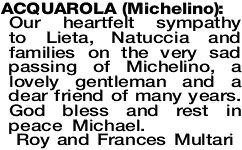 Our love and deepest sympathy to Lieta on the sad loss of dear Michael. Our thoughts and prayers are with you. 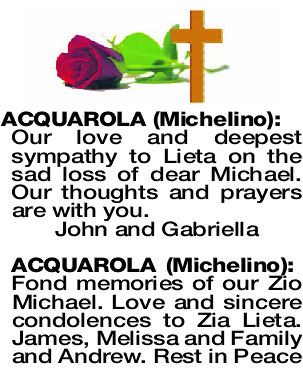 Heartfelt sympathy to dear Lieta, Christina, Natuccia and family. Heartfelt sympathy to Lieta and respective family. 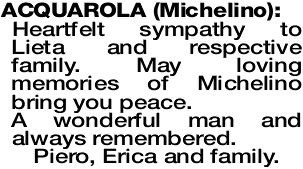 May loving memories of Michelino bring you peace. A wonderful man and always remembered. ACQUAROLA MICHAEL Our beloved Uncle Michael. Forever remembered for your loving heart and cheekiness. No words can describe how much we will miss you. 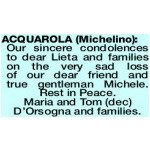 Deepest sympathy to Aunty Lieta and our darling Nonna. 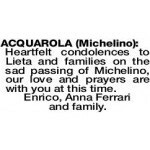 Heartfelt condolences to Lieta and families on the sad passing of Michelino, our love and prayers are with you at this time. Enrico, Anna Ferrari and family. 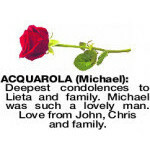 ACQUAROLA MICHAEL Deepest sympathy to dear Comare Lieta on the passing of Michael, a beautiful soul and valued friend who will be dearly missed. 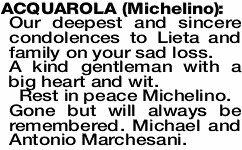 Our sincere condolences to dear Lieta and families on the very sad loss of our dear friend and true gentleman Michele. Rest in Peace. Maria and Tom (dec) D'Orsogna and families. Fond memories of a dear friend. Heartfelt sympathy to Lieta. Our thoughts are with you at this sad time. 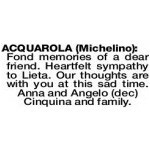 Anna and Angelo (dec) Cinquina and family. 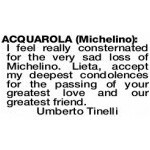 Heartfelt condolences to Lieta on the sad passing of Michelino. Our thoughts and prayers are with you. May he rest in peace. 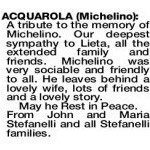 Our heartfelt sympathy to Lieta, Natuccia and families on the very sad passing of Michelino, a lovely gentleman and a dear friend of many years. 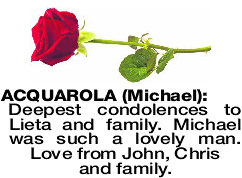 God bless and rest in peace Michael. 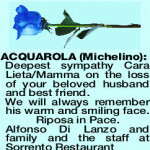 ACQUAROLA MICHELINO Deepest sympathy Cara Lieta/Mamma on the loss of your beloved husband and best friend. 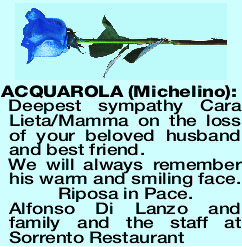 A tribute to the memory of Michelino. Our deepest sympathy to Lieta, all the extended family and friends. 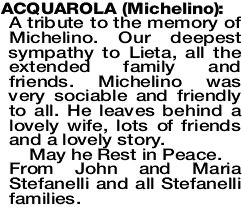 Michelino was very sociable and friendly to all. He leaves behind a lovely wife, lots of friends and a lovely story. May he Rest in Peace. From John and Maria Stefanelli and all Stefanelli families. Treasured memories of a very special person. 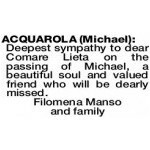 Heartfelt condolences to Comara Lieta. Our deepest and sincere condolences to Lieta and family on your sad loss. A kind gentleman with a big heart and wit. 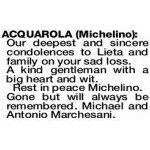 Rest in peace Michelino. Gone but will always be remembered. Michael and Antonio Marchesani. 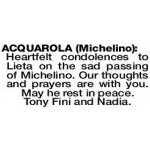 I feel really consternated for the very sad loss of Michelino. Lieta, accept my deepest condolences for the passing of your greatest love and our greatest friend. 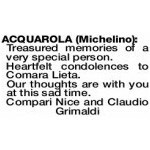 Our sincere condolences to the Acquarola family. May Michael rest in peace. 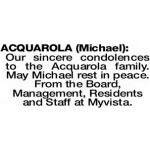 From the Board, Management, Residents and Staff at Myvista. Deepest condolences to Lieta and family. Michael was such a lovely man. Love from John, Chris and family.